We getz Nagi cover - Yay! Synopsis: Just like I called it in the previous chapter synopsis, it’s implied off-panel that Nagi allows Hayate to go and do whatever it is that he wants to do for Ruka. Hayate goes with Dr. Kurosu in her Lamborghini and Hinagiku tags along at the last moment for some reason. Since the Lamborghini is only a two-seater, Kurosu apparently makes Hayate ride in the trunk in the front of the car. Meanwhile, back in the Violet Mansion, Nagi ponders whether or not she should have asked hayate about witnessing him hugging Ruka from behind and apparently making a declaration of love by saying, “I will make you happy,” however, she realizes that she made the right decision by not asking because if Hayate had answered that he would marry Ruka in order to make her happy, then she would never have recovered. 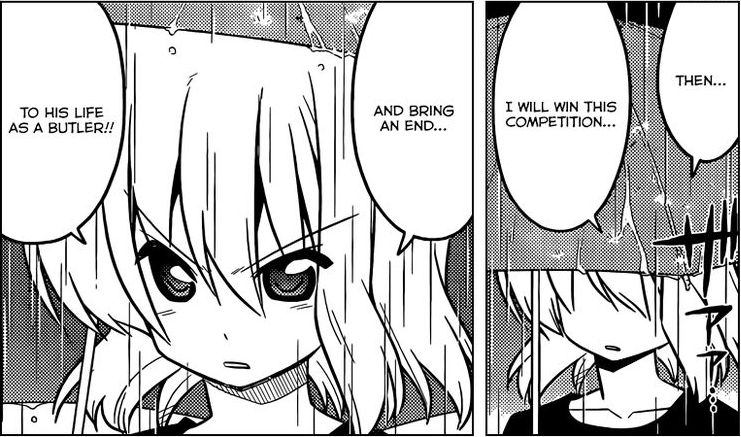 The solution for Nagi was pretty simple: all she had to do was win the manga competition and then Ruka would give up. Thus, filled with determination, she works alone on her manga while reflecting on the stuff that she’d been through to get this far. Still it was already August 4 and the deadline was August 14. Her storyboard was 30 pages long while her manuscript was completely blank. She had to draw extremely fast in order to get her manga done in time for the competition. Fortunately, Chiharu arrives and after a quick banter, offers to help her by applying the finishing touches to her manga. At Ruka’s studio, she asks for some time to finish things off with someone. “declaration of war” to Nagi. 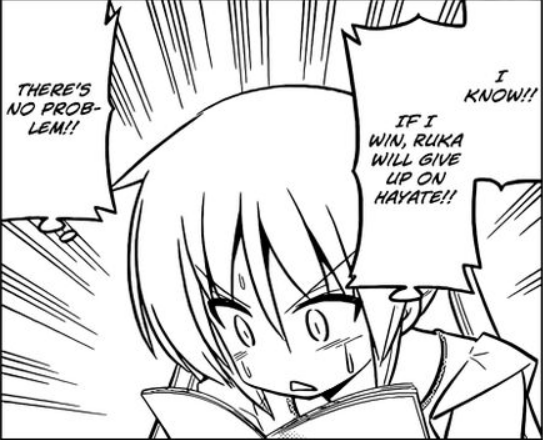 She needs Hayate, so she would take him for herself if she won the manga competition. Of course, Nagi is having none of that and she responds with “I won’t let you, because Hayate is my butler!” even though she believes that Hayate might be in love with Ruka. Review: YESSSS! Goooo Nagi! Well, it might not have been such a huge secret that I’m a Nagi fan given the Nagi-centric articles, essays, fanfic and fanart that I’ve been flooding my blog with recently, but I have to tell you that I just love the way she reacted in this chapter since it really shows how much she’s matured as a character while being totally in-character for her – she does hate to lose after all. Also, I'm glad that we didn't get this scenario. 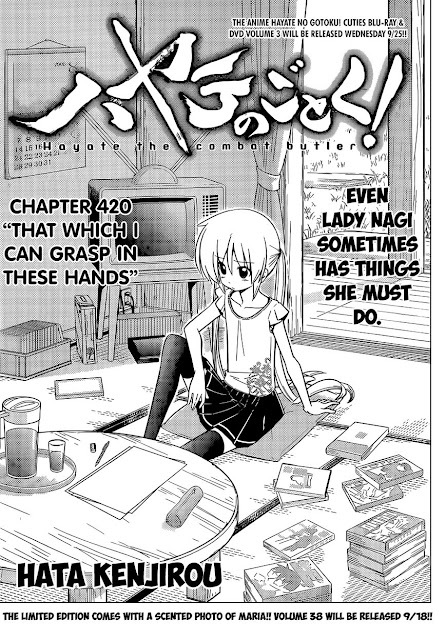 Finally, we get another Nagi chapter after so many filler chapters involving Ruka. 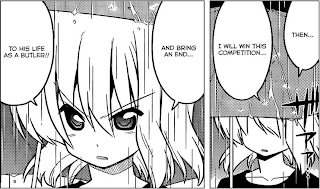 It’s pretty hard to tell who will eventually win the manga competition at this point, but it’s safe to say that Nagi should get her moral victory over Ruka at the end of this arc. I fully expected her to suffer a breakdown (which would be well-justified) after Hayate’s emotional 1-2 punch in chapter 419, but instead, she decides that she’s not going down without a fight. Meanwhile, Ruka may be giving up on her mangaka dream, but there’s no way she’s giving up on Hayate and the manga competition with Nagi just yet. I love how the end of this chapter sets up for an epic manga showdown between Nagi and Ruka: dare I say, destined rivals? Of course, given that they’ve both barely started on their manuscripts, we can probably expect them to initiate this “showdown” by helping each other out in the next chapter or whenever Hata plans to continue this storyline as he could unexpectedly throw in a Fumi and Sharna filler after so many serious chapters. Ruka's giving off some serious villain vibes here. Also, the Hakuo baka-trio are nowhere to be seen now after Hata made them seem relevant a few chapters back. They might still be filming things between Nagi and Ruka in the background. 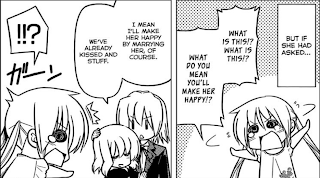 At this point, I have only a vague idea of where Hayate and company might be going, but it seems that whatever it is that would “make Ruka happy” has nothing to do with taking Ruka along. With Hinagiku already tagging along, it might involve some degree of fighting and therefore, probably has something to do with Yozora Housen, that picture of young Himegami and probably a King’s Jewel; thus, we can probably expect to see Sakuya and Isumi make an appearance at some point. Also, I’m going to start laughing hard if it turns out that Kurosu is also some kind of martial arts expert who fights with surgical knives – if you know what I’m saying. Never gonna give you up, never gonna... okay, sorry about that. Over-all,this was a really satisfying chapter for me as a Nagi fan. I couldn’t care less about what Hayate and company are about to do at this point and am more excited to see how the mangaka battle between Nagi and Ruka eventually pans out. Also, I'm calling it now: Kurosu is totally NOT Ruka's mother. Remember that even though all the obvious clues seem to imply this that Hata never plays his cards straight. The next chapter comes out in September 18 according to the last page of the manga, so expect it two days earlier on September 16 - depending on where you're from.